Following are the main features that you should be aware of when comparing temperature loggers. Many of the features also apply to thermometers. The resolution is an indication of how specific the answer is. It is measured in degrees. The smaller the value, the better the device. For example, a resolution of 0.5° means that a reading of 3.5° could be between 3.25° and 3.75°. A resolution of 0.1° means that a reading of 3.5° could be between 3.45° and 3.55°. The maximum allowable resolution depends upon the application. For example, when monitoring body temperature it is critical to have at least 0.1° resolution. For food, this level of resolution is often not necessary – here, the change in temperature that has to be recorded is a couple of degrees and a resolution of 0.5° is often acceptable. The accuracy indicates how close to the actual temperature a reading is. The smaller the number, the better the device. The current HACCP requirement in the food industry for accuracy is typically 1°C. Here, the first man could state the time as “1:34 PM and 23 seconds” but it could be up to 5 minutes out. His answer is specific (good resolution) but inaccurate. The second man can only say the time is “1:36 PM” but will be within one minute of the time. His answer has a lower resolution but is more accurate. The Logger: The device itself will cause errors because of limitations in digital processing and physical issues (e.g. “cold junction compensation” with thermocouples). The Sensor: The sensor is often the greatest source of error in the reading. It is also difficult to compensate for sensor errors. It requires that the only sensor ever to be used with the instrument and that it be used at a certain temperature. Thermistors and PT100s are interchangeable within 0.4°. Thermocouples, however, have much greater errors. Type K can have errors up to 2.2° and 1° for Type T. Special tolerances can reduce the Type T’s errors by half and make them acceptable for use with food. Type K should never be used with food. They are outside the 1° accuracy required.Note that the accuracy required is the total of the instrument and sensor error. For example, if an instrument has a 0.4° error and a sensor has a 0.8° error then they are not acceptable because the total is 1.2° error.Many devices fail because they have an accuracy of 1° plus a percentage error of the reading (eg 1° +/- 3% of reading = 1.3° at 10°). It is the total possible error that is important in determining if a system complies with the standards. Measurement error: This depends mainly upon the skill of the operator and what they are trying to measure. Using the wrong device will produce a false reading. For example, an infra-red thermometer measures surface temperature only, so the temperature within the item could be significantly different. 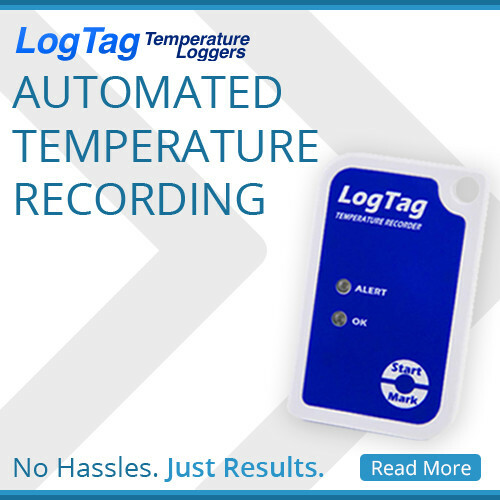 Like most items, temperature loggers can break. Consideration should be given to the robustness and build quality of the logger if it is to be transported or regularly moved. Stainless steel loggers are available, although most loggers are plastic. Water resistance is another feature that should be considered, especially if the logger is to be used in a wet or dirty environment. Water damage can be a common occurrence if the wrong logger is selected. Within the food industry it is strongly recommended that water-resistant loggers be considered. Loggers vary in size. They can be the size of a coin, to as big as large rack-mounted machines. For the larger sized units there is typically a probe that will be inserted into the item or area to be monitored. Most units have replaceable batteries, so the battery life should be considered based on usage requirements. If it is too short then you will be continually replacing batteries. There is also the risk of loosing data mid-journey. Temperature loggers often offer a range of techniques to start the logging. A start delay is useful for programming loggers prior to usage. They can then be sent to the user or picked up later. A trigger is another handy feature. For example, when the temperature reaches 6° then start logging. This means that memory is not being used while it is within the correct temperature range but will start as soon as extreme conditions occur. Remote starting devices are also available for many loggers. These devices allow a person to start the logger without a computer.